I’m weird—I’m a chef who enjoys having to cook within limitations. Sometimes when I have the option to cook whatever I want, it can be a little overwhelming. But when I can cook, say, with only ten ingredients, that's when I start to get really creative! Limitations force me to think especially carefully about each ingredient, focusing on which ones are essential to a recipe and which might not be as important. 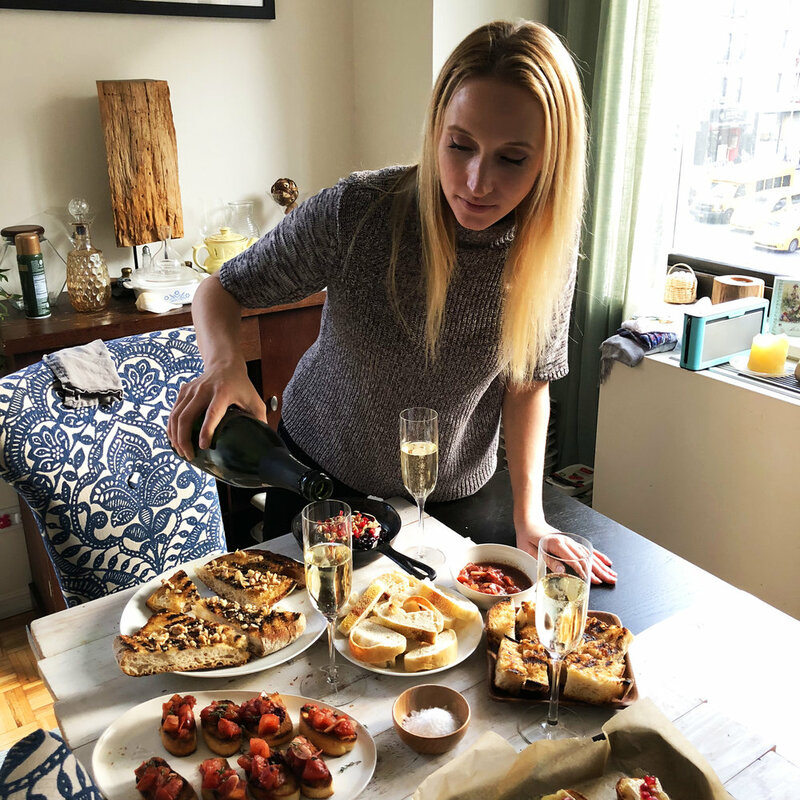 For this challenge, I decided to do an appetizer party—to have people over earlier in the evening, when spirits are high and I can still keep my eyes open! My idea was to serve a bunch of bites that people could take as they liked. I had brie on my mind because I just made a Baked Brie with (homemade!) Blackberry Apple Jam + Pecans for my Nikki Dinki Cooking site. But for my appetizer party, I stripped the recipe down a little, using a store-bought jam (which I’m sure most people would do anyway). Then I topped it with things I knew I could use elsewhere in this challenge—walnuts, thyme, and pomegranate seeds. Because I already had the brie, I thought I could use it in a second recipe, this time to make a crostini. Yes, it’s still melted brie, but atop the crunchy bread with honey, black pepper, and tart pomegranate seeds, it feels like a whole new dish! Next I decided to use the bread in another way, as an appetizer on its own. I find that grilled bread is just incredible—crunchy and charred but still chewy on the inside! I went with two versions; for the first, I made my Charred Tomato Garlic Bread, which involves rubbing the grilled bread with cut garlic and the juice of a tomato. And for the second version, I grilled the bread, then added a drizzle of honey, a good amount of black pepper, and finally some chopped walnuts, resulting in sticky deliciousness! These two appetizers took me all of five minutes to make! I had leftover tomato and garlic from the charred bread, so I thought why not make another crostini with a simple tomato sauce? And that’s when things got crazy! Looking at the other ingredients, I wondered what it might be like to bring some of the jam from the baked brie to the party? Did I know it would work? Not really. But I thought it might, and sometimes you just have to take a risk and try something! The result was a more elegant and deeper flavor with a rich color that made me want to dive right in. Before I knew it, I was nine ingredients in and five appetizers down! But what are we drinking?! Since this was an appetizer party and people wouldn’t be staying all night, I felt good about serving just one beverage: champagne! I mean, who says "no" to a glass of champagne?! Of course, nobody did. 😉 Cheers! Preheat the oven to 375°F. Cut the top rind off the brie wheel and discard it. Place the brie wheel in a small, round, oven-safe dish, then place the dish on a baking sheet and cook until the cheese is melty—8 to 10 minutes. Remove the baked brie from the oven and top it with the blackberry jam, walnuts, pomegranate seeds, and thyme leaves. Serve with your favorite bread or crackers. Turn on the broiler, to high if you have that option. Arrange the baguette slices on a rimmed baking sheet, then top each of the slices with 1 piece of the brie. Broil until the bread is toasted and the cheese is melty—3 to 5 minutes. Remove the crostini from the oven and drizzle them with honey. Then sprinkle each with the pomegranate seeds and the ground pepper. Serve immediately with a knife and fork, or simply just pick up and enjoy! When the bread is charred, remove it from the heat, then drizzle each half with 1 tablespoon of the honey. Finish the bread by sprinkling it with the walnuts and crushed peppercorns. If you don’t have a grill pan, you can use a regular skillet or put the bread under the broiler. If you use a broiler, place the bread as close to the flame as possible and only char it on the cut-side (otherwise, the bread may become too dry). Heat a grill pan over high heat. Heat the oil in a small skillet over medium heat, then add the garlic and ½ teaspoon of the salt and cook until the garlic is golden in color—3 to 4 minutes. 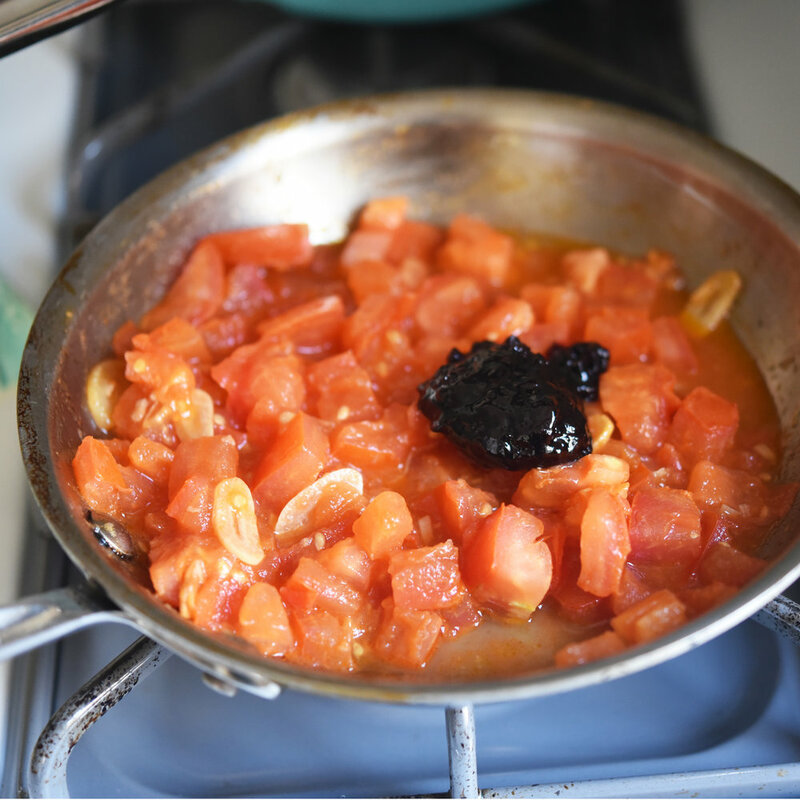 Add the tomatoes and the remaining ½ teaspoon of salt to the skillet and continue cooking until the tomatoes have broken down and formed a chunky sauce—5 to 7 minutes more. Stir the jam into the mixture until it is incorporated, then remove the skillet from the heat. Drizzle both sides of the bread slices with oil, then place them in an even layer on the grill pan. Cook the bread until it is toasted and strong grill marks appear—2 to 3 minutes. Then flip the bread and cook until it is toasted with strong grill marks on the second side—2 to 3 minutes more. Remove the bread slices from the heat and top each one with about 2 tablespoons of the tomato sauce. Then top the sauce with the thyme and sea salt if you desire.